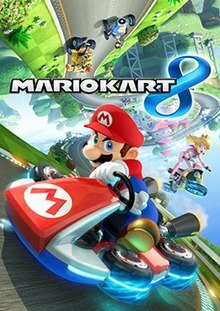 Mario Kart 8[a] is a kart racing video game and the eighth major installment in the Mario Kart series, developed and published by Nintendo for their Wii U home video game console. The game was announced at E3 2013 and released worldwide in May 2014. Like in other games in the series, in Mario Kart 8, players control characters from the Mario franchise and participate in kart racing on various race tracks, using a variety of items to hinder opponents or gain advantages in the race. While incorporating game mechanics originally featured in earlier Mario Kart games, Mario Kart 8 introduces anti-gravity sections that allow players to drive on walls or ceilings, in addition to allowing them to bump into one another for a short boost. The game features single-player and multiplayer gamemodes, including online via the Nintendo Network. Mario Kart 8 was a critical and commercial success upon its release, and is the best-selling Wii U game, with more than eight million copies sold worldwide. The game continued to receive post-release patches and downloadable content, including additional characters, vehicles and tracks, and support for Nintendo's Amiibo line of figurines. An enhanced port for the Nintendo Switch, titled Mario Kart 8 Deluxe, was released worldwide in April 2017. It is both a critical and commercial success, selling over fifteen million copies worldwide by December 2018, ranking it the system's best-selling game. The game continues the traditional gameplay of the Mario Kart series, in which characters from the Mario universe race against each other in go-karts, attempting to hinder their opponents or improve their racing performance using various tools found in item boxes. In addition, the game includes four different difficulties, which can be selected before beginning the race to challenge players. Returning features from previous installments include motorbikes and twelve-player racing from Mario Kart Wii, as well as hang gliders, underwater racing and vehicle customization from Mario Kart 7. Mario Kart 8's new features include anti-gravity racing, in which certain parts of a track can allow racers to drive on walls and ceilings. During these sections, players can bump into other racers or special bumpers to trigger a Spin Boost, which gives them an extra speed boost. New characters include the Koopalings, Baby Rosalina, and Pink Gold Peach. New items include the Boomerang Flower, which can be thrown to attack players, the Piranha Plant, which attacks nearby racers and obstacles, the Crazy Eight, which gives the user eight items, and the Super Horn, which can be used both to attack nearby opponents and defend against items, including the previously nearly unavoidable Spiny Shell. The game features 32 tracks in eight cups (Mushroom, Flower, Star, Special, Shell, Banana, Leaf, and Lightning), with an additional 16 later released as downloadable content (DLC) in four additional cups: Egg, Triforce, Crossing, and Bell. Along with local multiplayer, Mario Kart 8 supports online multiplayer with up to twelve players and voice chat outside of races, however voice chat is only available with friends online. Prior to the cancellation of Nintendo's Miiverse social network on November 7, 2017, players could set up tournaments with customizable rules and schedules, share races automatically recorded in-game to the online video platform YouTube, and receive in-game stamps for use on Miiverse by beating staff times and completing Grand Prix races. Due to the cancellation of Miiverse, these features have been removed from the game, although downloading ghost data from friends or top players is still possible. The Wii U version of the game is compatible with the Wii U GamePad, Wii Remote and Nunchuk, Wii U Pro Controller, Wii Classic Controller and Wii Wheel, while the Nintendo Switch version can be played with an individual Joy-Con turned on its side, the Joy-Con Grip controller shell, the console tablet with both Joy-Con attached, or the Nintendo Switch Pro Controller. Players can use Amiibo figures to unlock Nintendo-themed costumes that can be worn by Miis. A free software update to the Nintendo Switch version was made in June 2018 that allows players to use the Toy-Con Motorbike from the Nintendo Labo Variety Kit as a compatible motion controller. Initially confirmed in a January 2013 Nintendo Direct presentation, the game was later unveiled at E3 2013. Some members of Bandai Namco Games were given special thanks in the game's credits. The "8" in the game's logo was designed to resemble a Möbius strip, as was Mario Circuit, one of the tracks in the game. Early in development, the idea of using a drill to penetrate the ground was considered but was quickly discarded for not being as creative as anti-gravity. New features and enhancements are added via game updates. The first update, released in August 2014, includes rearranged post-race options, an optional course map on the game screen, a player statistics screen, and improved online stability. The second update, released in November 2014 adds support for Nintendo's Amiibo figures, allowing players to unlock Mii racing outfits based on other Nintendo characters. The third update, released in April 2015, added a new 200cc class, a first for the series, and additional racing suits unlockable via Amiibo. Additional characters and tracks for the game have been released as downloadable content. The first is a free set of Mercedes-Benz-themed vehicles: the 2014 Mercedes-Benz GLA, 1957 SL 300 Roadster, and 1934 W25 Silver Arrow, which were released on August 27, 2014 as part of the Version 2.0 update. On August 26, 2014, Nintendo announced two purchasable DLC packs, with each pack containing three additional characters, four additional vehicles and eight additional tracks; some of which are based on other Nintendo franchises, including The Legend of Zelda (Hyrule Circuit), Animal Crossing, F-Zero (Mute City and Big Blue) and Excitebike (Excitebike Arena). The first DLC pack, released in November 2014, features Tanooki Mario, Cat Peach and Link as playable characters, while the second pack, released in April 2015, features Dry Bowser, Villager and Isabelle. Additional multi-colored Yoshis and Shy Guys are given to players who purchase both DLC packs. Nintendo's launch promotions of Mario Kart 8 included a Limited Edition, which included a Spiny Shell figurine, and special Mario and Luigi themed console bundles, which included a hat, strategy guide, Wii Remote Plus controller, Wii Wheel and GamePad protector. In North America, Europe, and Australia, players who purchased and registered Mario Kart 8 on Club Nintendo before July 31, 2014 received a free download code for a selected Wii U game. As part of a promotional campaign with Mercedes-Benz, Mario, Luigi, and Peach were featured in a series of Japanese commercials for the Mercedes-Benz GLA, while three karts based on past and present Mercedes-Benz vehicles were added to the game as part of a downloadable update on August 27, 2014. In 2014, fast food company McDonald's released Happy Meal-branded toys based on the game's characters and karts. A soundtrack album containing 68 tracks from the game was made available as an exclusive reward available to Club Nintendo members shortly preceding the service's discontinuation in 2015. The original game received "generally favorable" reception, while Deluxe received "universal acclaim", according to review aggregator Metacritic. Considered by Eurogamer to be "the most vibrant home console racing game in years", the game was praised for its "exquisite details", vast sense of scale, orchestrated soundtrack, and gameplay. Digital Foundry deemed it to be "near perfection" with "phenomenal attention to detail", featuring a "magnificent visual package" and "magical playability". Their technical analysis attributes the game's smoothness of motion and overall gameplay, to its typically high performance of 60 frames per second (FPS), with the split-screen mode's effective 30 FPS nonetheless comparing favorably with industry standard. GameSpot generally praised the game, but criticized the game's Battle Mode for reusing the game's main race courses instead of presenting uniquely created battle arenas as prior Mario Kart games had done. "Luigi's death stare" is an Internet meme describing the automatic facial expression displayed by Luigi toward other characters upon attacking or passing them during a race, in which he gives them a disapproving glare in passing. It was featured in several viral YouTube videos and animated GIFs, and the phenomenon was covered by WNYW in early June 2014. The meme was acknowledged by Nintendo during their E3 2014 digital event. Venture Beat praised Nintendo's handling of the meme, noting that it was a "slick way" of acknowledging fan culture. The meme was nominated for the Best Gaming Moment at the 32nd Golden Joystick Awards. Shortly after the game's launch in the United Kingdom, it was announced that week-on-week Wii U console sales had risen 662% in the country, with Mario Kart 8 bundles accounting for 82% of the units sold. In its first four days on sale, it became the fastest selling Wii U game to date, with over 1.2 million copies sold worldwide. Within a month of the game's release, it had increased to 2.82 million. By the end of 2017, the game had sold over 8.42 million copies worldwide, making it the best selling Wii U game by then. Readers and staff of Eurogamer voted it as the Game of the Year, and GameSpot gave it the award of "Best Wii U Game". The game was nominated for "Best Wii U Exclusive" in GameTrailers' 2014 Game of the Year Awards; for "Best Game" in Giant Bomb's 2014 Game of the Year Awards; and for "Overall Game of the Year" and "Wii U Retail Game of the Year" in Nintendo Life's Reader Awards 2014, while it won both awards for both categories in their Staff Awards 2014. It won "Game of the Year" by The Guardian. In IGN's Best of 2014 Awards, the game was nominated for "Best Multiplayer" and "Best Racing", while it won the award for "Best Wii U Game". In their Best of 2017 Awards, the Switch version was nominated for "Best Switch Game" and "Best Remake/Remaster". It was nominated for "Best Switch Game" in Destructoid's Game of the Year Awards 2017, and won the award for "Old Game of the Year" in Giant Bomb's 2017 Game of the Year Awards. An enhanced port for the Nintendo Switch, titled Mario Kart 8 Deluxe, was released worldwide on April 28, 2017. This version includes all previously released DLC content, additional content, gameplay tweaks, and native 1080p graphics at a full 60 frames per second while docked. Some features in Deluxe are reworked or restored from previous generations of Mario Kart games: Battle Mode has eight new arenas and several gameplay modes; the Boo and Feather items are restored; and players can carry two items at once, even if they don't drag the first item. Six additional playable characters were added to the roster, including Bowser Jr., Dry Bones, King Boo, Inkling Boys and Girls from Splatoon, and an unlockable Gold Mario costume for Metal Mario. Deluxe includes new racing suits for Mii characters unlocked via Amiibo, and additional kart parts for customization. Nintendo's head of software development, Shinya Takahashi, confirmed in July 2018 that Mario Kart 8 Deluxe would receive further updates, with the first, a new vehicle and alternate costume for Link based on those seen in The Legend of Zelda: Breath of the Wild, being released the same month. Updates have added support for Nintendo Labo peripherals as compatible controllers. The port received critical acclaim with many critics highlighting the revamped battle mode as a welcome improvement over the Wii U version. It holds a score of 92/100 on Metacritic. IGN gave it a score of 9.3/10, stating that the game is "just as amazing in 2017 as it was in 2014". Eurogamer, referencing the revamped Battle Mode, stated that Nintendo fixed one of the game's only shortcomings in a "generous port of a modern masterpiece". Mario Kart 8 Deluxe was one of the best-selling games of 2017 at Amazon. It became the first Mario game since Mario Kart Wii in 2008 and the first Nintendo game overall since Pokémon Black and White Version in 2011 to reach No. 1 on the charts in the United Kingdom. Mario Kart 8 Deluxe became the fastest-selling game in the franchise's history, with more than 1.2 million copies sold worldwide within three days. By March 2018, more than nine million copies had been sold worldwide, ranking it among the best-selling games on the platform, only after Super Mario Odyssey. Three months later, sales had surpassed ten million. As of December 31, 2018[update], total sales reached 15.02 million, making it the best-selling Nintendo Switch game. ^ Rigg, Jamie (November 18, 2012). "Mario Kart 8 launching on Wii U in spring 2014 (video)". Engadget. Retrieved June 13, 2013. ^ a b Konno, Hideki. Wii U Developer Direct – Mario Kart 8 @E3 2013 (A/V stream) – via YouTube. ^ "Mario Kart 8's First DLC Pack Will Add Mute City From F-Zero, Zelda-Themed Course". November 5, 2014. ^ a b Plunkett, Luke (June 25, 2018). "Mario Kart 8 Deluxe Now Supports Nintendo Labo". Kotaku. Retrieved June 26, 2018. ^ "It Looks as Though Namco Bandai Helped Out on Mario Kart 8". My Nintendo News. May 29, 2014. Retrieved June 29, 2014. ^ "E3 2013: Nintendo's Hideki Konno Pulls Back The Curtain On 'Mario Kart 8′". MTV. June 17, 2013. Archived from the original on September 2, 2013. Retrieved September 7, 2013. ^ a b c Jenna Pitcher (August 6, 2014). "Mario Kart 8 Mercedes Car DLC Hits This Month With Update". ign.com. Ziff-Davis. Retrieved August 6, 2014. ^ Adi Robertson (June 10, 2014). "Nintendo Amiibo brings real-world toys into 'Super Smash Bros.' and 'Mario Kart 8'". The Verge. Vox Media, Inc. Retrieved August 6, 2014. ^ LeJacq, Yannick (August 27, 2014). "Now that's a Yoshi of a different color!". Kotaku. Retrieved August 29, 2014. ^ Parfitt, Ben (April 24, 2014). "Nintendo reveals exclusive Team Mario and Team Luigi Mario Kart 8 Wii U bundles | Games industry news". MCV UK. Retrieved April 30, 2014. ^ Parfitt, Ben (April 30, 2014). "Free Wii U game offered with Mario Kart 8 | MCV". MCV UK. Retrieved May 15, 2014. ^ "Get A Free Wii U Game For Buying And Registering Mario Kart 8". Siliconera. April 30, 2014. Retrieved May 5, 2014. ^ Karmali, Luke (May 29, 2014). "Mario Kart 8 Teaming up With Mercedes Japan For Free DLC". IGN. Retrieved May 29, 2014. ^ "Mario Kart 8 Mercedes-Benz DLC Coming to North America, Europe". Gamespot. June 22, 2014. Retrieved June 28, 2014. ^ Pereira, Chris (June 17, 2014). "Mario Kart 8 Toys to Come With McDonald's Happy Meals". GameSpot. Retrieved April 1, 2015. ^ Life, Nintendo (July 27, 2015). "Mario Kart 8 Soundtrack CD Club Nintendo Reward Powerslides Into View". Nintendo Life. ^ a b "Mario Kart 8 for Wii U Reviews". Metacritic. Retrieved August 30, 2014. ^ a b c d "Mario Kart 8 Deluxe for Switch reviews". Metacritic. Retrieved April 28, 2017. ^ "Mario Kart 8 – Wii U". IGN UK. April 30, 2014. Retrieved May 15, 2014. ^ a b Otero, Jose (April 20, 2017). "Mario Kart 8 Deluxe Review". IGN. Retrieved July 4, 2017. ^ Towell on May 15, 2014, Justin (February 13, 2014). "Mario Kart 8 review". GamesRadar. Retrieved May 15, 2014. ^ Schilling, Chris (April 20, 2017). "Mario Kart 8 Deluxe review". gamesradar. Retrieved July 4, 2017. ^ "Mario Kart 8 Review". GameTrailers. April 30, 2014. Retrieved May 15, 2014. ^ "Mario Kart 8 review". Destructoid. Retrieved May 15, 2014. ^ "Mario Kart 8 Deluxe review". Destructoid. Retrieved April 20, 2017. ^ a b Parkin, Simon (May 15, 2014). "Mario Kart 8 review". Eurogamer. Retrieved May 15, 2014. ^ "Mario Kart 8 for Wii U review". Nintendo World Report. Retrieved May 15, 2014. ^ "Mario Kart 8 for Nintendo Switch review". Nintendo World Report. Retrieved April 20, 2017. ^ "Mario Kart 8 Deluxe for Nintendo Switch review". Nintendo Life. Retrieved April 20, 2017. ^ a b McShea, Tom (May 15, 2014). "Mario Kart 8 Review". GameSpot. Retrieved May 24, 2014. ^ Plagge, Kallie (April 20, 2017). "Mario Kart 8 Deluxe Review". GameSpot. Retrieved July 4, 2017. ^ Navarro, Alex (May 15, 2014). "Mario Kart 8 Review". Giant Bomb. Retrieved June 26, 2014. ^ "Mario Kart 8 review". Edge Online. May 15, 2014. Retrieved May 24, 2014. ^ Schulenberg, Thomas (April 28, 2014). "Mario Kart 8 review: Hover conversion". Joystiq. Retrieved May 15, 2014. ^ "Another Great Lap – Mario Kart 8 – Wii U". GameInformer. May 15, 2014. Archived from the original on May 16, 2014. Retrieved May 15, 2014. ^ Shea, Brian (April 20, 2017). "Mario Kart 8 Deluxe". Game Informer. Retrieved July 4, 2017. ^ a b "2014 Children's Game". BAFTA. Archived from the original on November 24, 2014. Retrieved November 24, 2014. ^ Linneman, John (May 24, 2014). "Digital Foundry vs Mario Kart 8: Mario & All-Stars Racing Refined". Digital Foundry. Eurogamer. Retrieved May 24, 2014. ^ Elise, Abigail (June 6, 2014). "Luigi Death Stare In 'Mario Kart 8' Goes Viral". International Business Times. Retrieved June 6, 2014. ^ Hooton, Christopher (June 2, 2014). "Luigi's 'death stare' will instantly make you want to buy Mario Kart 8". The Independent. Retrieved June 8, 2014. ^ Corriera, Alexa Ray (June 2, 2014). "Luigi isn't playing games with his 'death stare' in Mario Kart 8". Polygon. Retrieved June 6, 2014. ^ Purcell, Patrick (June 7, 2014). "Luigi's death stare from Mario Kart 8 – our video guide to the best memes and gifs". Mirror. Retrieved June 8, 2014. ^ Plunkett, Luke (June 4, 2014). "Luigi's Death Stare Makes TV News". Kotaku UK. Retrieved June 6, 2014. ^ McFerran, Damien (June 4, 2014). "Weirdness: Luigi's Mario Kart 8 'Death Stare' Is Deemed Noteworthy By Fox News". Nintendo Life. Retrieved June 8, 2014. ^ LeJacq, Yannick (June 10, 2014). "Luigi's Death Stare Made A Cameo in Nintendo's E3 Address". Kotaku. Retrieved June 17, 2014. ^ Grubb, Jeffery (June 12, 2014). "How Nintendo used the Luigi Death Stare without ruining fans' fun". VentureBeat. Retrieved June 18, 2014. ^ Reynolds, Matthew. "Golden Joystick Awards 2014 public voting now open". DigitalSpy.com. Retrieved September 1, 2018. ^ Yin-Poole, Wesley (June 3, 2014). "Mario Kart 8 off to a great start". Eurogamer. Gamer Network. Retrieved June 3, 2014. ^ "Nintendo Earnings Q1 2014" (PDF). Nintendo Co., Ltd. Retrieved July 30, 2014. ^ "Top Selling Software Sales Units – Nintendo Wii U Software". Nintendo. Retrieved January 31, 2018. ^ McFerran, Damien. "Mario Kart 8 Has Now Sold 8 Million Units Worldwide". Nintendo Life. Retrieved October 28, 2016. ^ "Eurogamer's Game of the Year 2014". Eurogamer. January 1, 2015. Archived from the original on December 14, 2014. Retrieved January 1, 2015. ^ Robinson, Martin (January 2, 2015). "Reader's top 50 games of 2014". Eurogamer. Gamer Network. Archived from the original on January 3, 2015. Retrieved January 3, 2015. ^ "Mario Kart 8 – Wii U Game of the Year". GameSpot. December 14, 2014. Archived from the original on December 14, 2014. Retrieved December 14, 2014. ^ GameTrailers (July 19, 2016). "Game of the Year Awards 2014 – Best Wii U Exclusive". YouTube. Retrieved March 4, 2018. ^ "Giant Bomb's 2014 Game of the Year Awards: Day Five Text Recap". Giant Bomb. CBS Interactive. December 30, 2014. Archived from the original on December 31, 2014. Retrieved December 31, 2014. ^ Whitehead, Thomas (December 25, 2014). "Game of the Year: Nintendo Life's Reader Awards 2014". Nintendo Life. Archived from the original on December 26, 2014. Retrieved December 25, 2014. ^ Whitehead, Thomas (December 24, 2014). "Game of the Year: Nintendo Life's Staff Awards 2014". Nintendo Life. Archived from the original on December 24, 2014. Retrieved December 24, 2014. ^ Stuart, Keith (December 19, 2014). "The 25 best video games of 2014". The Guardian. Archived from the original on December 22, 2014. Retrieved December 19, 2014. ^ "Super Smash Bros. for Wii U". IGN. January 13, 2015. Archived from the original on January 13, 2015. Retrieved January 13, 2015. ^ "Forza Horizon 2". IGN. January 13, 2015. Archived from the original on January 13, 2015. Retrieved January 13, 2015. ^ "Mario Kart 8". IGN. January 13, 2015. Archived from the original on January 13, 2015. Retrieved January 13, 2015. ^ "Best of 2017 Awards: Best Switch Game". IGN. December 20, 2017. Retrieved January 19, 2018. ^ "Best of 2017 Awards: Best Remake/Remaster". IGN. December 20, 2017. Retrieved January 19, 2018. ^ Valdez, Nick (December 14, 2017). "Nominees for Destructoid's Best Switch Game of 2017". Destructoid. Retrieved January 19, 2018. ^ Giant Bomb staff (December 25, 2017). "Game of the Year 2017 Day One: Old, Disappointing, Shopkeepers, and Looks". Giant Bomb. Retrieved March 17, 2018. ^ Kain, Erik (December 6, 2014). "All The Winners of the 2014 Game Awards". Forbes. Retrieved December 11, 2014. ^ Whitehead, Thomas (February 6, 2015). "Nintendo Picks Up Three Gongs at the D.I.C.E. Awards". Nintendo Life. Archived from the original on February 6, 2015. Retrieved February 6, 2015. ^ "Games in 2015". BAFTA. February 10, 2015. Archived from the original on February 12, 2015. Retrieved April 7, 2015. ^ Macatee, Rebecca (February 20, 2015). "2015 Nickelodeon's Kids' Choice Awards Honor Nick Jonas, Meryl Streep: See the Complete List of Nominees!". E!. Retrieved February 23, 2015. ^ Gaito, Eri (November 13, 2017). "Golden Joystick Awards 2017 Nominees". Best in Slot. Retrieved January 19, 2018. ^ Weber, Rachel (November 17, 2017). "The Legend of Zelda: Breath of the Wild scores big at the 35th Golden Joystick Awards presented with OMEN by HP". GamesRadar. Retrieved January 19, 2018. ^ "NICKELODEON ANNOUNCES 2018 KIDS' CHOICE AWARDS NOMINATIONS". Nick.com. Viacom. February 26, 2018. Retrieved March 3, 2018. ^ a b Gartenberg, Chaim (January 13, 2017). "Mario Kart 8 Deluxe is coming to the Nintendo Switch". The Verge. Retrieved January 13, 2017. ^ Forde, Matt (March 13, 2017). "Mario Kart 8 Deluxe Runs at 60fps in 1080p When Docked". Nintendo Life. Retrieved August 17, 2017. ^ Makuch, Eddie (July 20, 2018). "Mario Kart 8 Deluxe Getting More Updates On Nintendo Switch". ^ McWhertor, Michael (July 19, 2018). "Mario Kart 8 Deluxe update adds Link from Breath of the Wild". Polygon. ^ Robinson, Martin (April 21, 2017). "Mario Kart 8 Deluxe review". Eurogamer. ^ Sarkar, Samit (April 28, 2017). "Mario Kart 8 Deluxe is Amazon's best-selling game of 2017 so far". Polygon. Retrieved August 17, 2017. ^ Dayus, Oscar. "Top 10 UK Sales Chart: Mario Kart 8 Deluxe Is Nintendo's First No.1 For Six Years". GameSpot. Retrieved January 31, 2018. ^ Rosenberg, Adam (May 1, 2017). "Nintendo sold 1.2 million copies of 'Mario Kart Deluxe' in three days". Mashable. ^ "IR Information : Sales Data - Top Selling Title Sales Units". Nintendo Co., Ltd. Retrieved July 31, 2018. ^ "IR Information : Sales Data - Top Selling Title Sales Units". Nintendo Co., Ltd. December 31, 2018. Retrieved January 31, 2019.